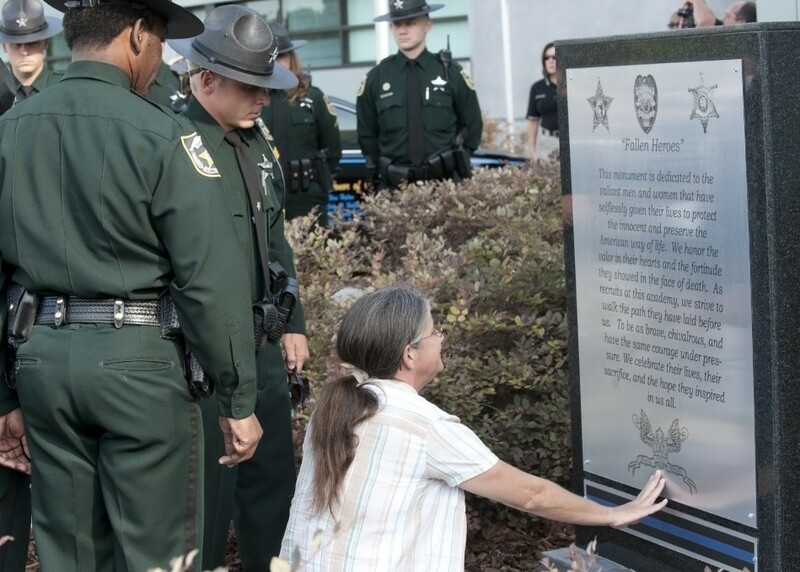 Valencia’s Criminal Justice Institute (CJI) hosted a memorial service on April 27 to honor Orange County Deputy Brandon Lee Coates who died in the line of duty last December. Deputy Coates attended basic recruit law enforcement training at CJI in 2006. His wife, Orange County Deputy Sheriff Virginia Coates, is also a graduate of the program. Donna Marino, donor stewardship manager at Valencia Foundation, announced at the ceremony that a memorial scholarship fund had been established in memory of Coates. An initial gift of $500 was made by students now enrolled in the same class that Coates once was. Numerous law enforcement officials from central Florida, along with Deputy Coates’ widow and mother, Debbie Griffin, attended the ceremony. CJI’s ceremony was the first of many local, state and national law enforcement ceremonies that occur each May to honor officers who have died in the line of duty. To make a donation to the Brandon Lee Coates Memorial Scholarship Fund, please visit Valencia Foundation’s Web site at www.valencia.org.